The Western Desert Tarantula (Aphonopelma chalcodes), which is also commonly referred to as the Mexican Blonde Tarantula or the Arizona Blonde Tarantula, is one of the most common species of tarantula found in the Southwest United States. These spiders prefer the cactus riddled desert landscapes of Arizona, New Mexico, and Northern Mexico. The Western Desert Tarantula is rather large, with a body length ranging in size from three inches, all the way up to ten inches. They are tan in color, but the males may have black legs and a rust colored abdomen. These tarantulas make silk lined burrows underground, but can be commonly seen roaming around during the rainy monsoon seasons in the summer months. During the winter months, Western Desert Tarantulas cover their burrows with soil, small rocks, sticks, and other debris combined with their silk. During this time they will stay underground, waiting for the warmer weather when they can once again emerge to mate and feast on prey. Western Desert Tarantulas defend themselves with their venomous fangs and irritating hairs. They tend to brush some of their hairs on their predators, causing significant discomfort and irritation. While these tarantulas do bite, and do posses venom, the venom is not very potent. They are docile spiders and will only bite on rare occasion. 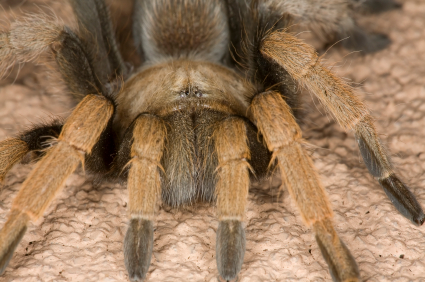 It’s because of their docile nature; many people keep these tarantulas as pets.